This was the engagement of the day. I met PCSO John Diaz and colleagues. We had a chat about the variety of initiatives that they were involved in. I had met some of PCSOs in Boundary Way at the end of August. The meeting in August had led to this invitation. I plan to go back and support them at the end of October. We walked to School Mead and met all the shop keepers. We discussed how the building changes had helped change the area and reduce crime. John Diaz has been a PCSO in Abbot Langley for a few years and has built a good reputation in the area. 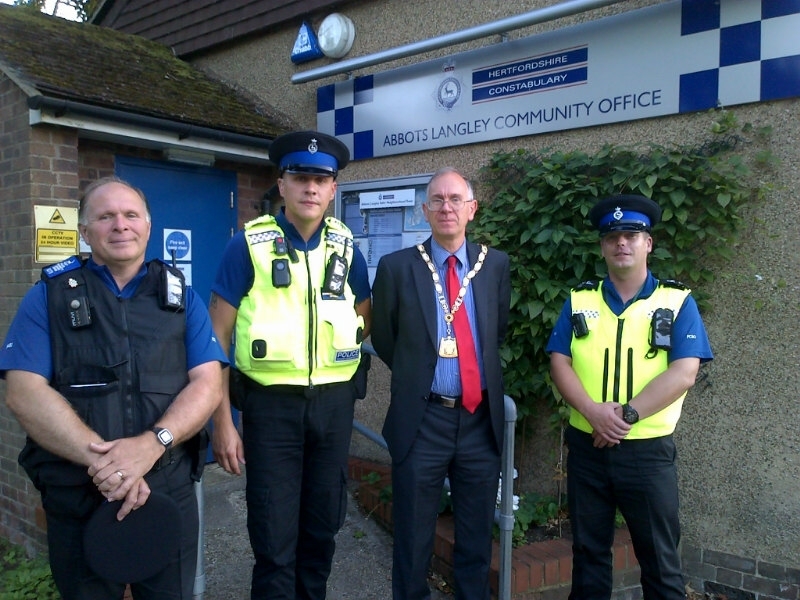 He was training up new recruits who will be able to build on the ideas that he and his colleagues have already been doing to help keep Abbotts Langley Parish a safer Neighbourhood. This was going to be my first of 4 Police Walks in nine days. It has enabled me to see the District I know and love in a new light. It demonstrates the importance of partnership within our communities. Some of John Diaz’s ideas could be shared as best practise in other parts of Three Rivers and Hertfordshire. I would recommend if you do not get the OWL emails that you sign up for them.